It has taken me far too long to get around to writing up this splendid lunch, generously hosted and organised by a great wine lover who also supplied all the bottles. The theme was a simple one – Pinot Noir. All the wines came from either Champagne or Burgundy. The venue was The Square, certainly one of London’s best and the kind of place where the logistics of 16 wines and 15 people is carried off in a relaxing and efficient way. The food was tremendous as always. To “kick things off” with the canapés we had Philiponnat Royale Reserve Brut, a soft and creamy Champagne that worked well pre-food at lunch as there is a decent dosage in there and the acidity isn’t prominent, very good. The first course was a tremendous Grouse Pie, delicious and done with a great deal of finesse. The three flights of red Burgundies that followed were all served blind but with many a theme to ponder, a lot of thought had gone into this! With there being a few of us supposed trade “experts” in attendance the initial comments were, rightly, expected to come from our seats. Over the course of the meal we did pretty well with a combination of educated guesses and the odd stab in the dark!! In the first flight you could find several themes, one vintage was different, two were 1er Crus etc. Gevrey-Chambertin Mes Favorites VV 2001, Domaine Alain Burguet had lovely soft fruit, was very true to 2001. Primary with a dash of orange zest. Very good. 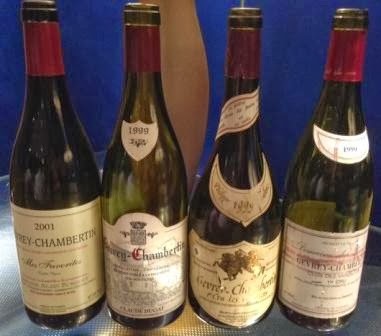 Gevrey-Chambertin 1999, Domaine Claude Dugat was the first glass I finished, never a bad sign, very drinkable, elegant and complete if not overly complex. Gevrey-Chambertin 1er Cru Les Cazetiers 1999, Domaine Philippe Leclerc this was a step up, good weight of fruit, a little drier than the previous two, bigger also, classy. Very slightly oxidative with a developed note at the end, I liked this, certainly not a fault. Impressive. Gevrey-Chambertin 1er Cru Clos de Varoilles 1999, Domaine des Varoilles The only one of the Domaines in this first flight that I know well. This was possibly the stand out, though very different in style from the Cazetiers, very pure and poised. Good acidity and focus, very fine. The next course was now upon us Roast breast of Yorkshire Grouse with Croustillant of the leg, baked Celeriac and Blackberry. We were also into a flight of pure Grand Crus, always a good thing! As you can see the themes continued with different Crus and different vintages. One of the main surprises in this section was that the 2005’s were showing as much fruit as they were, it certainly caught me out. Echezeaux Grand Cru 2005, Domaine Jean Marc Millot was inky in Pinot terms, rich, very fine, excellent freshness of fine and forceful red fruit, splendid. 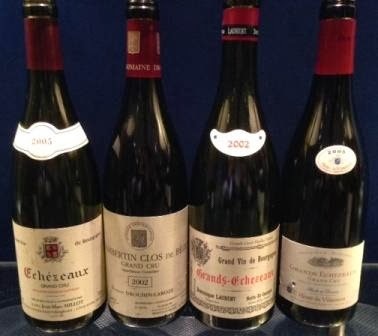 Chambertin Grand Cru Clos de Beze 2002, Domaine Drouhin-Laroze was fresh too, soft, expressive and surprised me as it did not have the “animal” I have come to except from 2002. Good. Grands Echezeaux 2002, Dominique Laurent a massive surprise for me as I have found the Laurent wines far too much for me in the past, too thick, too rich and over the top. This was not. A lovely loose and drinkable structure, some development and orangey, red fruit, good balance, it did develop in glass quickly which may not be the best sign but it is in a good place now and was very enjoyable. Grands Echezeaux 2005, Domaine Henri Villamont had the biggest and driest of the structures but then it is 2005 and it is from a very fine Terroir. This was how you would hope and expect it to be, big, quite bold and ready for a long future. There is a little bit of polish there too. One to watch. A brillaint but very un-Square like course follwed – Cheese and Ham on toast. I could eat it every day! Oh and more themes!! Romanee Saint Vivant Grand Cru 1998, Domaine Poisot This was a totally new name to me. A producer who until 2009 (it might be 2010) had sold the vast majority of his crop to a large negociant but had some older stocks that our host had found. The wine was good, excellent from now on. There was a slight minty note, it is a little “high”, almost some eucalyptus. Vosne Romanee 2007, Domaine Sylvain Cathiard ok, so this is the “joker” in the flight. There was a tiny hint of coffee and mocha from oak but otherwise this was not over oaked at all. Lovely intense fruit and a expressively elegant finish. Fine effort from a vintage I increasingly love for the purity of Pinot character. Romanee Saint Vivant Grand Cru 2007, Domaine Follin-Arbelete It’s not a competition but if it were this might have had the overall gong for “WOTD”. A very fine, deliciously rich without going over the top, wine that had lots of class. A real Grand Cru intensity and depth. Very fine. 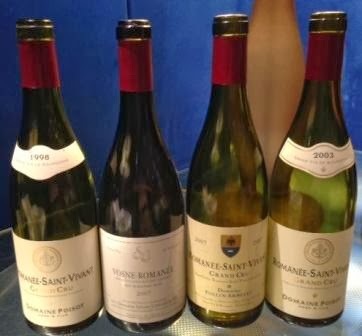 Romanee Saint Vivant Grand Cru 2003, Domaine Poisot so a different vintage of the RSV from Poisot. This was very complex, inky, fruit laden (the fruit being a little mulled), savoury sweetness, not very long on the finish, good but very much a 2003, lots of extremes. The wine as a whole was decadent and good. A really brilliant pudding followed – Brillat-Savarin Cheesecake with Pink Champagne and White Peach, Lemon Verbena and Peach Sorbet. 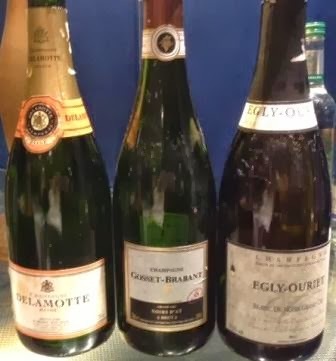 To accompany we had three nicely contrasting Champagnes. Delamotte Rose NV a wine I know well and one of the only Rose Champagnes to be made the “proper” way. This is mellow whilst soft and almost strawberry fruit but dry. Showed really well. Gosset-Brabant Grand Cru Noirs d’Ay NV was a first for me from this house, may be it was all the wines before but something made me think of a dry pineapple like flavour, drier than the Delamotte, really good, must try more from them. Egly-Ouriet Blanc de Noirs Grand Cru Les Crayeres this might just have grabbed the most attention of the Champagnes. Really delicious, richly fruited with raspberries but not a touch of sourness. What a splendid lunch, good conversation, a lot learnt and a very generous host!